If more people are retiring and living longer, we’ll need more money to look after them and therefore more people working and paying taxes than ever before – BUT . . .
There’s a problem that’s not being talked about, although the Government has already started working on. Independent living is being pushed today, but why? Unfortunately, as with a lot of things, it’s more about money than what’s good for the individual. The Government has an issue with the growing number of people who are reaching retirement. If the Government were to try and support them all, it’s clear that major economic issues will ensue. For the Government, Independent living is a powerful means of starting the process of managing this looming crisis, as it reduces the funding requirements for care of the elderly and less able, along with raising retirement age. On a positive note, there are benefits to independent living, as your elderly relative can remain comfortable at home without the hassle moving, where they will be in an alien environment, which is full of strange people they don’t know. If you’re a sibling or a person who keeps an eye on an elderly or disabled person, Independent living puts more pressure on you to keep a close eye on them. Do you struggle to find time to care for an elderly relative? So what is this looming problem? It’s to do with population and it’s not a problem of too many, but too few people. 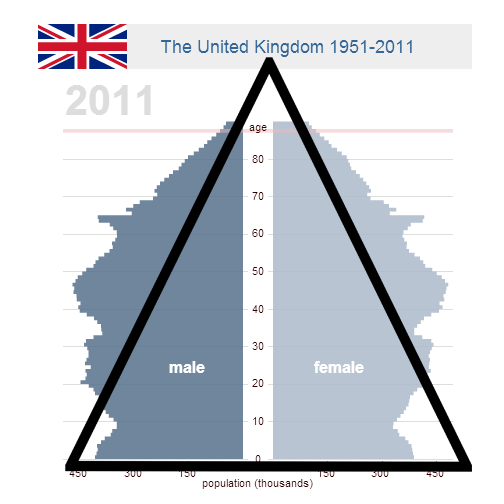 If you take a look at the video chart above, it scrolls through the years of population’s figures for the UK and what it shows is quite alarming from a ‘self-support’ point of view. Pyramids Fall Over if . . .
Let’s talk pyramids and I don’t mean Egyptian pyramids, although they have the same problem – if you don’t have a broad enough base, they can’t support themselves and so it is with our population. The growth of the population has slowed and people are living longer, which has resulted in a situation where there are going to be insufficient people working to fund the current infrastructure, including care for the less able and elderly. The problem is further exacerbated, by the large number of unemployed (many of who are in the younger generation, with some never having worked) and large number of students, all of whom are not paying taxes, but need support from the taxes being paid by the working man. You don’t need to be a great mathematician to see there is a problem which needs to be addressed now as opposed to when we’re drowning in the issues this will create. 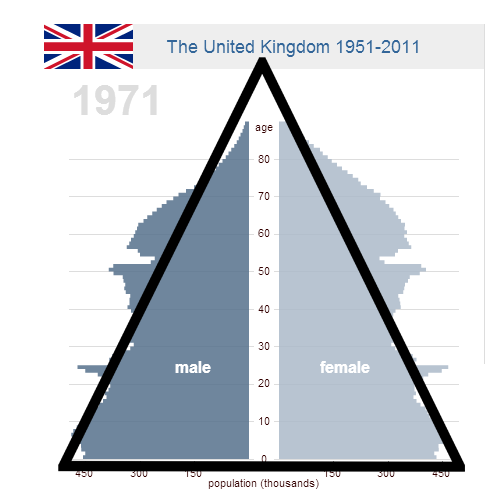 The 2 images above show the difference in population between 1971 and 2011. It shows that in 1971, this structure worked as there is sufficient amount of people to support the retired. In 2011, a large quantity of people, many of them currently employed and paying taxes, are soon approaching retirement. So, as they reach retirement age, who will look after them or perhaps a better question is HOW will they be looked after? Out of the 63.8 million population, around 30 million are working, but what’s going to happen when the next bulge on the graph start retiring and we have to rely on a reduced workforce to support a growing, ageing population. To add to the problem, around 50% of the unemployed people are in the younger age bracket which means they are not gaining the experiences needed to become part of a strong workforce that can earn the money to help fund the problem through taxes. How can we help your relative live independently? Now, the point of this article is not to talk about what’s likely to happen to taxes and services such as the NHS as we move towards this period in time, but, when looking at these figures, it’s easy to see why independent living is so high on the Government’s agenda – they know they need to reduce possible costs and it’s much easier to start pushing independent living now than in 10 - 15 years time when there will be an explosion in people reaching retirement age. All this means that over the coming years, we will see a change in the way we think about looking after our elderly and part of this will come in the form of technology which can monitor and therefore help create some peace of mind that will enable us to keep living our lives. Technology is already in use, but not on a broad scale, although I suspect this will change over the next 10 – 15 years as we are faced with issues of looking after someone, whilst still working and living busy lives. To see our approach to helping create some peace of mind for those with independents click here.